Sunday July 1st 1900 The boys were both gone all day. Will and I rested and read having a very quiet day. 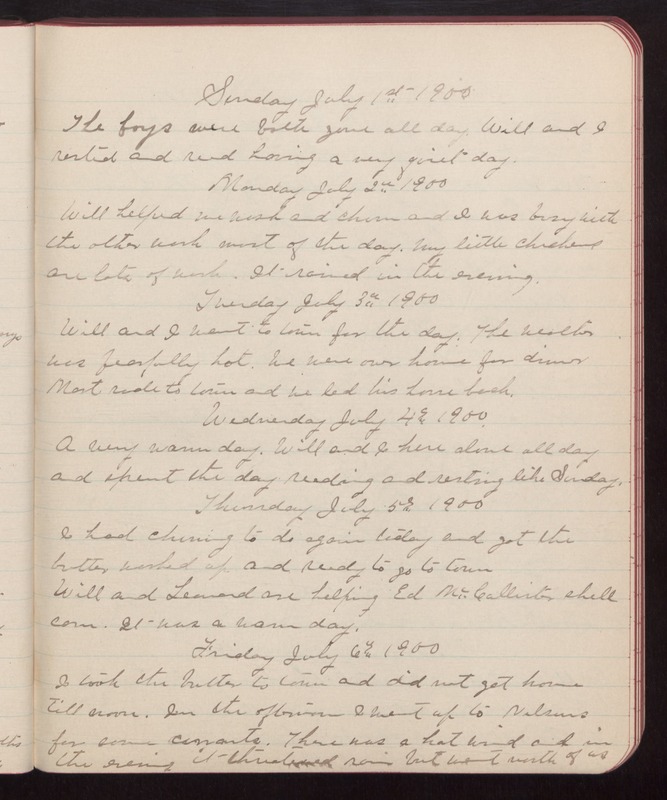 Monday July 2nd 1900 Will helped me wash and churn and I was busy with the other work most of the day. My little chickens are lots of work. It rained in the evening. Tuesday July 3rd 1900 Will and I went to town for the day. The weather was fearfully hot. We were over home for dinner Mort rode to town and we led his horse back. Wednesday July 4th 1900. A very warm day. Will and I here alone all day and spent the day reading and resting like Sunday. Thursday July 5th 1900 I had churning to do again today and got the butter worked up and ready to go to town Will and Leonard are helping Ed McCallister shell corn. It was a warm day. Friday July 6th 1900 I took the butter to town and did not get home till noon. In the afternoon I went up to Nelsons for some currants. There was a hot wind and in the evening it threatened rain but went north of us.